Nothing is worse than a toilet that won’t flush. One culprit could be a broken toilet handle. 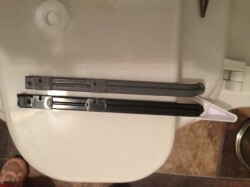 How to replace broken toilet handle? Simple! Firstly, when you toilet won’t flush, for whatever reason, take the top off the tank. While looking into the open toilet tank, try flushing it again. 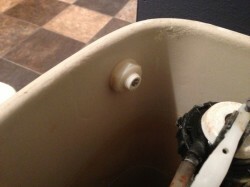 If the inner workings of the toilet are in tact, depressing the handle will lift the flap at the bottom of the tank. If depressing the handle results in the flap not moving at all, continue reading. The handle will be connected to a lever inside the tank. The lever is attached to a chain. The chain is attached to the flap in the bottom of the tank. This flap is rubber, and holds the water in the tank. In this case the handle was broken just inside the tank, and the lever was sitting in the bottom. The handle itself needed replacement. It was obvious that this toilet lever is broken, as the handle isn’t connected to anything internally. The replacement toilet handle comes with the internal lever. Removing the nut is simple, especially if you realize it may be threaded in reverse from normal. Trim the lever on the replacement toilet handle to match the length of the old handle. Remove the Tank Cover . Manually lift the Toilet Flap to flush the toilet, and drain the water from the tank. Remove any broken parts from the tank to ensure they don’t go down the drain. Install a replacement Toilet Handle using instruction provided on the packaging. The replacement toilet handle lever may have to be trimmed to fit toilet, if it’s universal. Using the broken lever as a guide, Trim to fit. Re attach the chain to the new lever. Depress the handle to ensure the lever lifts the flap. If the flap raises, turn the water supply back on, and try flushing the toilet, full of water. If everything works as normal, you’re done! Put the lid back on the tank. 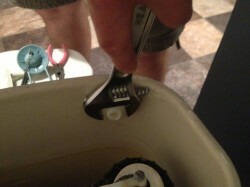 How to replace broken toilet handles: A handy father’s job. 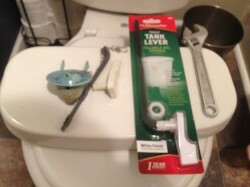 Do you have any experience replacing your toilet handle? Did it go smoothly? Answer in the comments below!